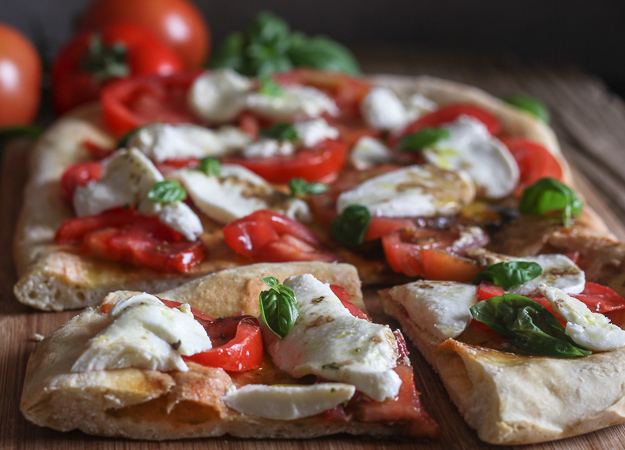 Easy Caprese No Yeast Pizza Dough, a simple, easy and so delicious Pizza. No yeast makes it the perfect weeknight meal. Fresh Tomatoes, Basil and Mozzarella make it yummy and healthy. You know the saying “an apple doesn’t fall far from the tree”, well I have to say in a lot of cases it is right on the mark. My husband and I have started our first year garden of summer vegetables after a not so bad first year of a fall/winter veggies garden. I have been hinting for years about starting our own garden, we always had an excuse, no time, too much work and the best of all with all the veggies my mother-in-law plants she could feed half the town. So now excuses aside we are on our way. Every morning I am off to water the garden, a few days ago it was a nice little garden, two types of lettuce, some beets because roasted beets are the best and don’t forget bush beans, love them. Then the apple fell from the tree, the Italian comes in the door a few evenings ago and declares “the tomatoes are in the ground”, wonderful, nothing like a Caprese Pasta Salad! The next morning as usual out to the garden I went (by the way our garden is just down the road we share a piece of land with my brother-in-law). Move over mother-in-law we are now feeding the other half of the town! He forgot to mention that he planted more beans, more salad and 2 long rows of tomato plants! OK I am not going to complain but really? So what to do? Start thinking about all those amazing tomato recipes I can come up with and make. I can bottle, freeze, dry and fry them and of course make one of our favourite lunch time dishes a caprese salad. 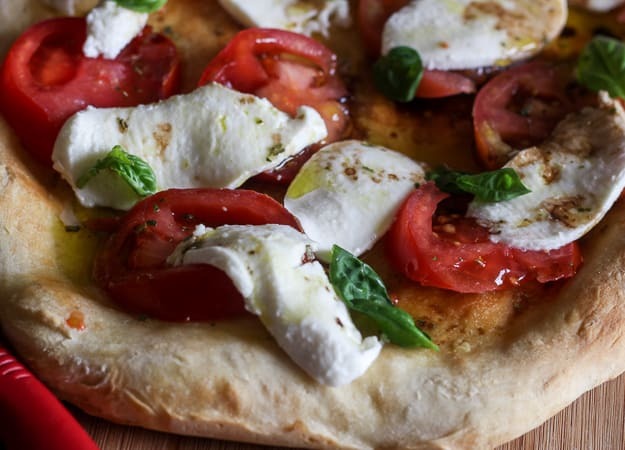 Better yet let’s make this delicious Easy Caprese No Yeast Pizza Dough. In Italy when you go to some local bakeries they have a vast assortment of different types of pizza and a lot of them are with a pizza dough base and a cold topping, great combination I have to say, especially this Italian Shrimp Pizza. Perfect summer dish. 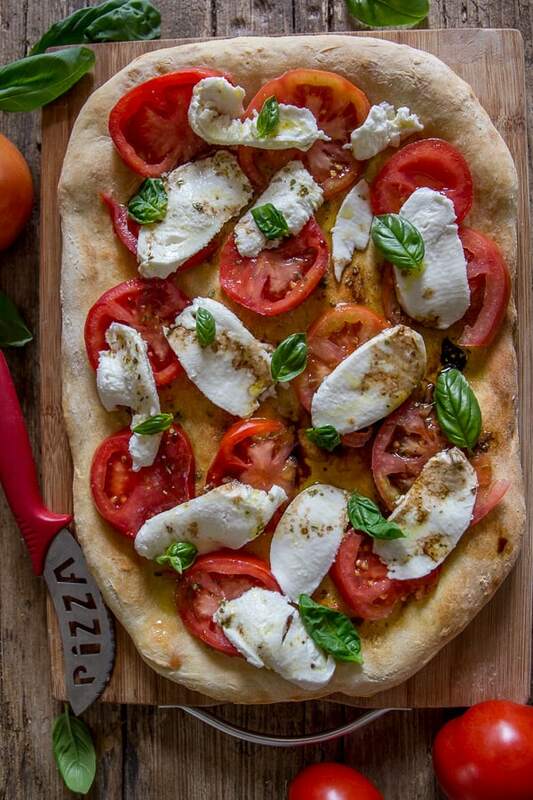 So I’m thinking I have the perfect no yeast pizza dough I can top it with a some fresh tomatoes, basil and mozzarella balls toss with some olive oil and there you have it! Did I mention I think this would make a great appetizer, instead of doing it in a round pizza pan spread the dough in a square or rectangle one and cut into small pieces. If you weren’t sure if summer had arrived yet, this No Yeast Pizza Dough will remind you it has or at least it’s just around the corner. Buon Appetito! 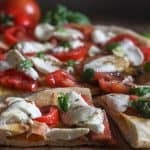 Easy Caprese No Yeast Pizza Dough, the perfect no yeast pizza, topped with a yummy Caprese mix of fresh ingredients. Healthy and Delicious. In a large bowl whisk together flour, baking powder, and salt, make a well in the middle and add the oil and 1/2 cup of water to start, stir together with a fork then add remaining water. Move to a lightly floured flat surface, knead for approximately 2 or 3 minutes and form into a smooth dough ball, cover with a bowl and let sit for 15 minutes. Place dough on lightly greased pizza pan or cookie sheet and with fingers form into desired shape (circle, oval or square) to cover the bottom of the pan. Bake for approximately 13- 15 minutes or until golden. In a small bowl whisk together olive oil, balsamic, salt, oregano, chopped fresh basil leaves. 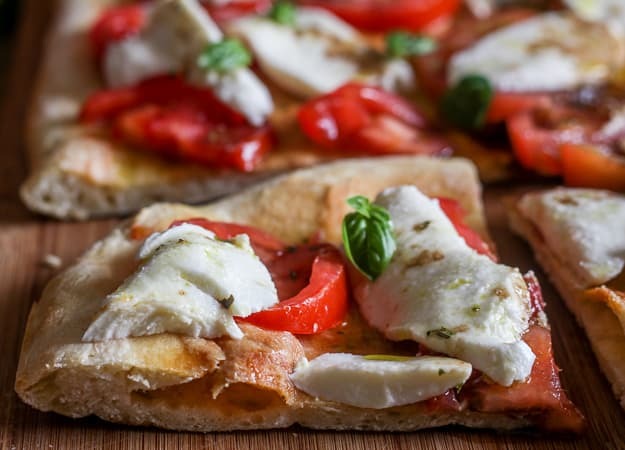 Place thinly sliced tomatoes on top of the baked dough, then top with thinly sliced mozzarella and drizzle with olive oil mixture. Serve immediately. This post has been updated from May 15, 2015 and I have to admit our vegetable garden is certainly not the vast assortment it used to be! “One cannot think well, love well, sleep well, if one has not dined well” Virginia Woolf, A Room of One’s Own. About 1.5 hrs before my guests arrived, I realized that I didn’t have any yeast at home. 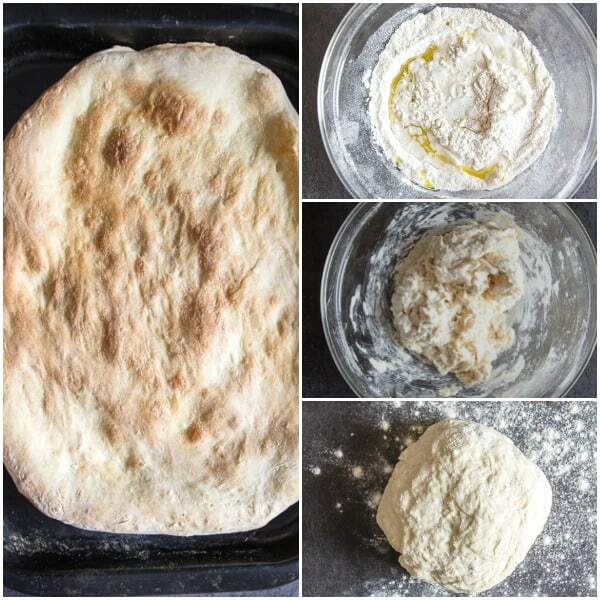 This pizza dough recipe came to the rescue in my time of need! Although I still prefer a yeast dough, this dough was a more than an adequate substitute in frantic moments such as tonight! Thank you for sharing! Hi Becky, Im sure it will be ok. Let me know how it goes. Can we use regular American white flour or is another kind more similar to what you use in Italy? Could I use a mixture of whole wheat and white? I Cecille yes you can use all purpose American / Canadian, which is what I use for my recipes also. You could use a mixture of whole wheat and all purpose but maybe a 1/4 whole wheat because it makes baked goods heavier and denser then all purpose. Hope that helps. 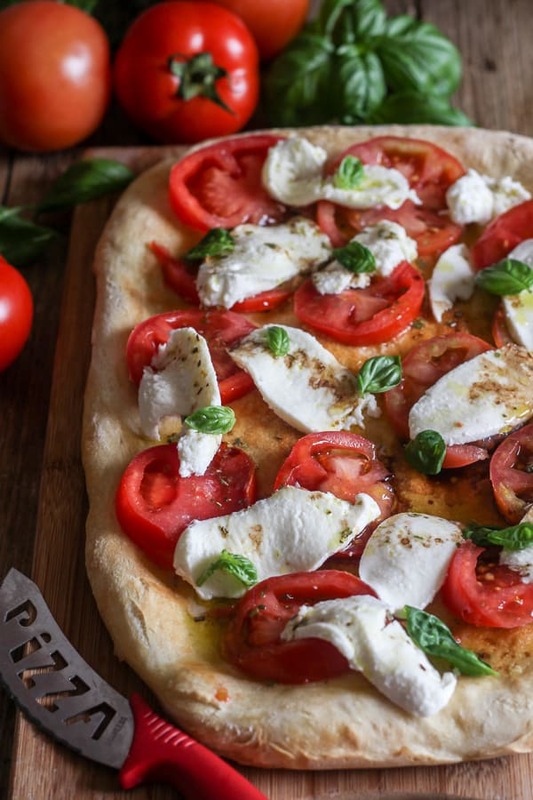 I would love to have a garden one day, nothing better than growing your own produce…love this easy to make pizza dough and the entire pizza with the tomatoes and fresh mozzarella looks so incredible! Hi Albert, thanks so much, yes I agree fresh veggies are the best. Have a great weekend. This looks like something I can order straight off a menu at an artisan pizzeria in Italy! Without any yeast involved, I’m declaring Wednesday nights pizza nights! Hi Katherine, so glad I could help! Thanks for the feature :). Yes indeed, I remember the days of our huge garden — then we downsized our home and there went the yard and vegetable garden. At first I was relieved not to have to mess with 100’s of Ball canning jars. Now I truly miss canning — I can just imagine all of the luscious veggies you’ll pick from your garden. I’m looking forward to your recipes. Have a wonderful weekend!